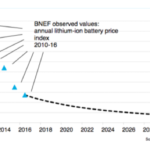 Battery costs today stand at $180/kWh, and are expected according to the recent Bloomberg New Energy Outlook to halve again by 2025. The rate of this price reduction is on a par with solar PV, which has led to an explosion of deployment globally. “We expect cheaper batteries to present new revenue opportunities. In the UK, wind and solar provide 19.4% of the country’s electricity. As this share rises still higher, it will drive volatility in the wholesale energy market and open the way for price arbitrage with batteries.” Nick Gibbins from NRP comments.